Paul Reed Smith introduces an SE edition of his Private Stock Alex Lifeson signature acoustic guitar. 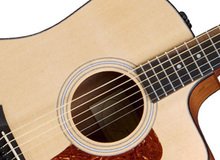 Yamaha introduces a new guitar in the A Series, the AC6R acoustic-electric, an evolution of the AC3R in limited edition. Martin & Co introduces the second guitar designed in collaboration with Ed Sheeran, the X Signature acoustic-electric model. The Tombstone brand is known for its instrument cases, but ESP will also design acoustic-electric guitars under the same name.